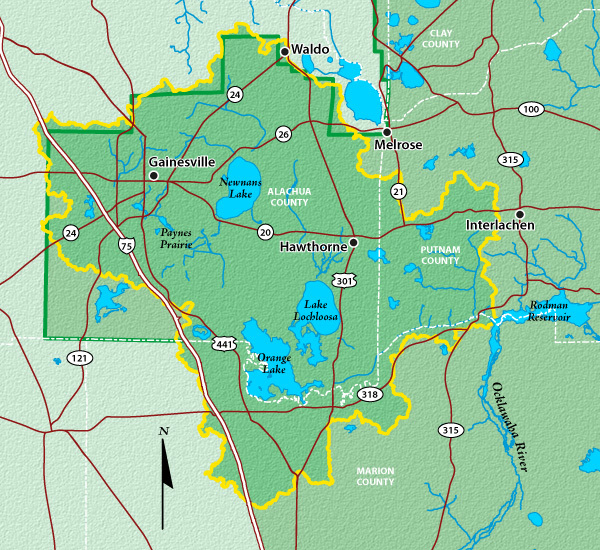 The 600-square-mile Orange Creek Basin is part of the lower Ocklawaha River watershed, primarily in Alachua County. Limestone beneath much of the surface of the basin has resulted in the formation of sinkholes, large shallow lakes and broad wet prairies. These shallow bodies of water fluctuate over a broad range due to droughts or heavy rains, natural processes essential for healthy shallow lakes and marshes. The Orange Creek Basin contains a variety of aquatic habitats, including Paynes Prairie, an extensive shallow marsh within a state park preserve. The largest lakes in the basin — totaling 29,000 acres — are Newnans, Lochloosa and Orange. Orange Lake, Lake Lochloosa, Paynes Prairie, River Styx, Cross Creek and Lochloosa Creek are “Outstanding Florida Waters,” a Florida designation that provides a high level of protection because of the exceptional richness of aquatic and wetland habitats. Paynes Prairie Preserve State Park is also a recognized National Natural Landmark. The basin has been challenged by altered hydrology, excessive organic sediment accumulation and invasive exotic plant species. The St. Johns River Water Management District’s Governing Board added the Orange Creek Basin to the Surface Water Improvement and Management (SWIM) program priority list in 2003. The program goal is to restore and maintain healthy aquatic and wetland habitats in the basin’s three large lakes and Paynes Prairie. The Orange Creek Basin SWIM program is focused on reducing pollutants, especially excess phosphorus in Newnans, Lochloosa and Orange lakes. Major activities include monitoring water quality and plankton communities, modeling pollutant loading, quantifying sources of nutrient pollutants and working cooperatively with state and local governments. For example, the district provided matching funds and technical assistance to the city of Gainesville for Sweetwater Wetlands Park, a 125-acre man-made wetland habitat adjacent to Paynes Prairie Preserve State Park. The park was designed to improve water quality to Paynes Prairie wetlands, Alachua Sink and the Floridan aquifer. The Orange Creek Basin has a rich history and is the area where famed author Marjorie Kinnan Rawlings wrote The Yearling and where she made her home at Cross Creek. In addition, the area has been known for its many waterways and diverse wildlife. The lakes and wetlands include 85 bald eagle nests around Newnans, Orange and Lochloosa lakes, more than most other areas in Florida. Thousands of migratory sandhill cranes winter in Paynes Prairie, mingling with resident Florida sandhill cranes. Wood storks and various other wading birds are commonly seen along lakes’ shorelines and in marshes, along with occasional whooping cranes, white pelicans, and roseate spoonbills. A wood stork colony breeds in a cypress swamp north of Orange Lake. Orange Lake’s natural floating islands, a tourist attraction in the 1940s, have an unusually high diversity and number of amphibians such as sirens and newts. Alligators can often be seen in large numbers from La Chua trail in Paynes Prairie. Black bear sometimes follow the edges of streams and lakes into the Orange Creek Basin from the Ocala National Forest. The diversity of habitats is, in part, a reflection of the large natural fluctuations in water levels within the basin. Surface water in the basin generally flows from north to southeast. Newnans Lake collects flows from a variety of creeks and discharges only via Prairie Creek. A portion of Prairie Creek’s flow was reserved from other uses to maintain wetlands in Paynes Prairie. This reservation was accomplished through a 1994 rule of the St. Johns River Water Management District. The rule was adopted because Orange Lake fish camp owners wanted all of Newnans Lake’s water to continue to be artificially diverted south through Camps Canal toward Orange Lake. Historically, Prairie Creek flowed into Paynes Prairie. The district compromised by reserving about half of the flow from Prairie Creek for Paynes Prairie and allows the remainder of the flow to continue being diverted via Camps Canal toward Orange Lake. Lake Lochloosa flows into Orange Lake through Cross Creek. During periods of high lake levels, water also flows through Lochloosa Slough to the east and into Orange Creek. Finally, Orange Lake flows into Orange Creek, which flows into Rodman Reservoir — an impounded segment of the lower Ocklawaha River. Sinkholes are an important component of the Orange Creek Basin’s hydrology. On the northern edge of Paynes Prairie, water flows into Alachua Sink, recharging the aquifer. Likewise, the southern portion of Orange Lake contains a system of sinkholes responsible for about 30 percent of all water leaving the lake. Over many years beginning in 1989, the district acquired nearly 50,000 acres of conservation lands in the Orange Creek Basin, either as full-fee purchases or as conservation easements, with costs sometimes shared by partners. These lands are managed by the district or its partners, and most are open to the public for recreational activities. Some of the property has been used for restoration projects, such as restoration of thousands of acres of shallow marsh at the 3,500-acre Orange Creek Restoration Area.